The full-petalled Paeonia Ann Cousins ​​has fantastic, white flowers. But it gets better! 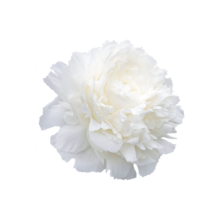 This enchanting peony has a wonderful, intense fragrance. Similar to that of roses, but much more powerful. Ann Cousins is full-petalled and shaped like a rose. It blooms late in the season. The flowers are pure white and can grow to about 17 cm wide. Sure, there are bigger white varieties available, but none of them has that phenomenal fragrance as Ann Cousins. This peony variety was first bred in 1946 by the Canadian breeder of the same name. Use a clean knife to cut the stems diagonally and place Ann Cousins in lukewarm water. Make sure that the leaves aren’t submerged; it’ll keep the water nice and clean. Add a bit of chlorine to the water for the best results . Before you know it, you’ll be surrounded by the lovely scent of roses.